“I don’t think that people realize all the food symbolism around Chinese New Year,” Diane Sheya, owner and culinary director of Salt Lake Institute of Culinary Education (SLICE) in South Salt Lake, says. Chinese New Year, also called Lunar New Year or Spring Festival, is a time of togetherness, when family and friends gather to feast and welcome the new year. This year, SLICE has put together a special Chinese New Year cooking class in honor of the Year of the Pig. The three-hour, hands-on workshop aims to bring new and old friends together around the most symbolic (and delicious) foods of the Lunar New Year. During the class, students will learn how to prepare four dishes and the symbolism behind each one. Then, you’ll sit down to dinner enjoy the fruits of your labor in addition to a special steamed fish prepared just for your meal. SLICE offers instructor-led cooking experiences for every skill level—from the beginner who is interested in knife basics to the home chef looking to spice up their meals with Indian curries or ramen to the emerging culinary professional seeking a position in the hospitality and culinary industry. Heat a wok or large sauté pan over high heat. When hot, swirl in 1 tablespoon of the cooking oil. Stir fry the ground chicken until browned. Remove browned ground chicken from wok to a bowl and set aside. Wipe the wok clean and turn heat to medium. When just starting to get hot, swirl in the remaining cooking oil. Add in the green onion, garlic and ginger and cook for 30 seconds. Take care not to burn these aromatics. Fold up one corner of egg roll wrapperAdd in the carrots and cabbage. Stir well and turn the heat to medium-high. Stir fry the vegetables for 2 minutes, or until the carrots have softened. Add the cooked chicken back into the wok, stir well. Add in the oyster sauce and toss again. Spread mixture on a baking sheet and let cool. Prop up the baking sheet on one end so that any liquid collects on the other side. When the mixture is cool, discard the liquid. Mix cornstarch slurry: in a small bowl, whisk together the cornstarch and water. 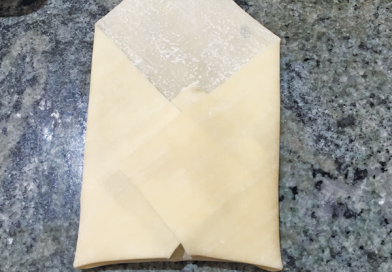 Open the egg-roll-wrapper package, cover with a barely damp towel to prevent drying out. 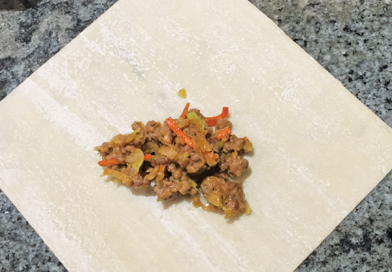 Add 1 tablespoon of filling to egg roll and roll up. Secure with cornstarch slurry. 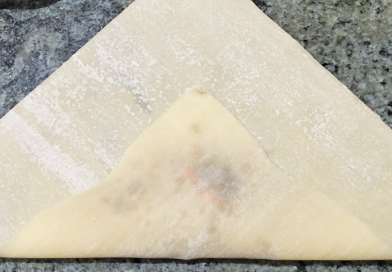 Keep rolled egg rolls covered with plastic wrap to prevent drying. 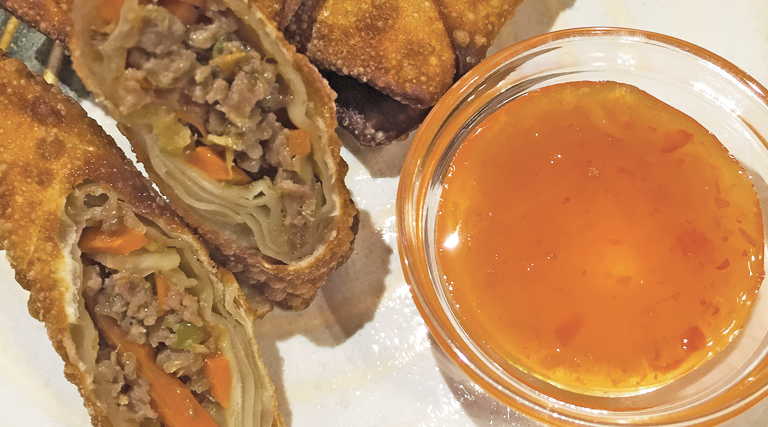 When ready to fry, heat 1 ½ inch of oil in a wok or deep, heavy skillet to 350 F. Carefully slide in the egg rolls, a few at a time, to the oil to fry. Turn the egg rolls occasionally to brown evenly and fry for about 3 minutes. Let cool on rack. Repeat with remaining. Use ground pork, beef, chicken or turkey in this recipe. Chinese rice wine is an optional ingredient, substitute with dry sherry (or just leave it out). 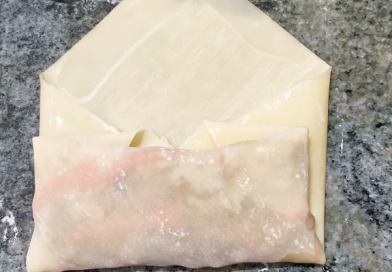 Freezing spring rolls: After rolling the spring rolls (but before frying), insert them in a freezer bag, in a single layer. Try not to overcrowd. Close bag, freeze. 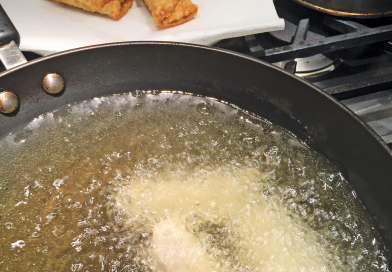 Frying frozen spring rolls: When ready to cook, you’ll go from freezer to frying, no defrosting necessary. Defrosting the spring rolls will make them soggy, wrinkly and ugly. Prepare your deep fryer (or wok with frying oil). When oil is 350 F, use long tongs and gently lower a few frozen spring rolls into the oil. Be careful as any ice crystals will splatter in the oil. Reheating leftover spring rolls: Heat your toaster oven or oven to 300 F. Place spring rolls on a rack and into the oven. Bake for about 5-7 minutes, until crispy.